I do all I can to avoid Camden Town on a Saturday. Being one of London’s most accessibly eclectic areas, it draws in huge crowds with its outrageous 3D store facades, bizarre street performers and cheap ‘alternative’ tat available the whole way along the main strip. As a teenager, I went to Camden for all of the above, but as a twenty-something living in North London I now go for three specific reasons: haircuts, gigs and food. Tucked in an unassuming corner of the packed-so-tight-you-can-hardly-breathe Stables Market is Cafe Loren*. 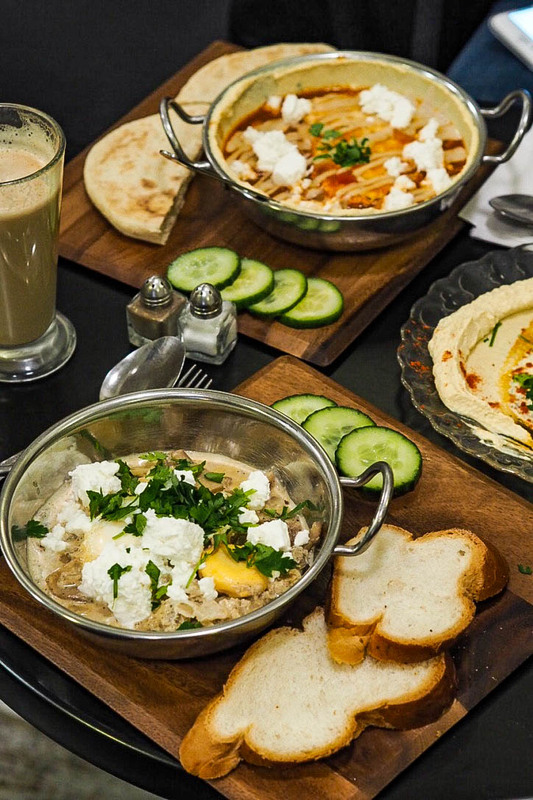 Able to seat less than 20 people, it commands a queue to get in because of its signature speciality: shakshuka. 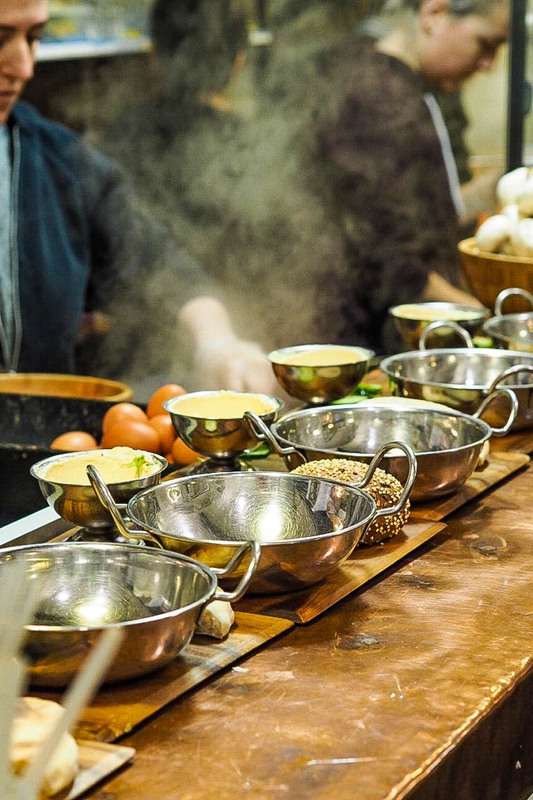 With ten varieties on the menu, every options includes the obligatory poached eggs but with the traditional tomato sauce changed up and served with different vegetables and spices. 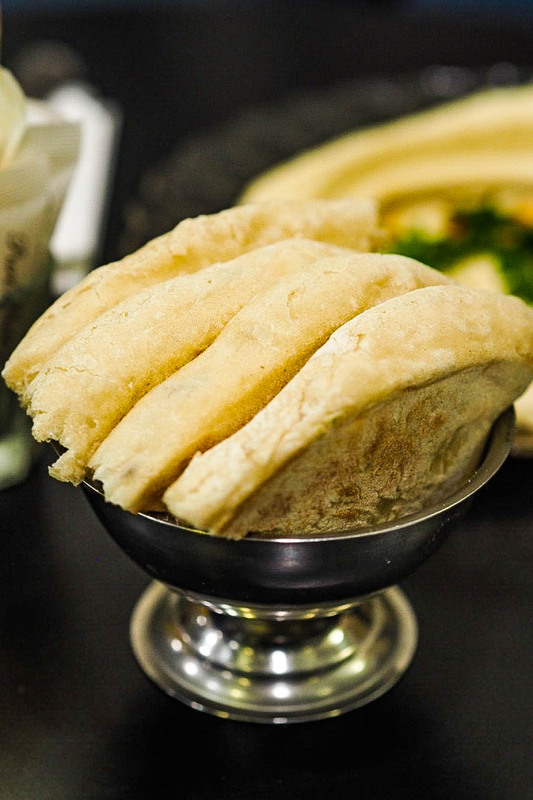 We started with a hummus plate to share which came swirled on plate, smooth and sprinkled with parsley and a smattering of paprika for a teensy, tiny kick. The triangles of pita bread that came with it though, were outstanding. Thick, soft and straight from the oven; steam rose off them as we tore them apart. 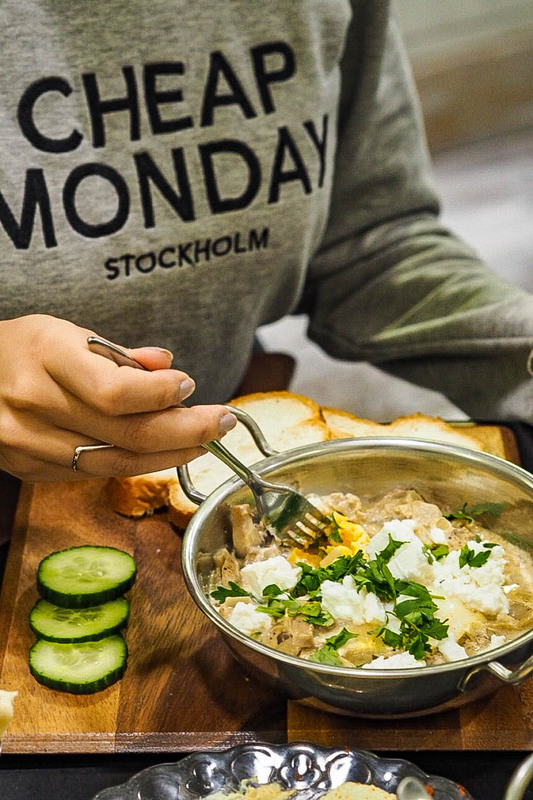 I went for the White Shakshuka which substituted the tomato sauce for one made with cream cheese and mushrooms. Seasoned with nutmeg, it was like a rich white sauce that I’d be more familiar having with pasta, but strangely, it really worked with the poached eggs (although sadly they were a little overdone for me). 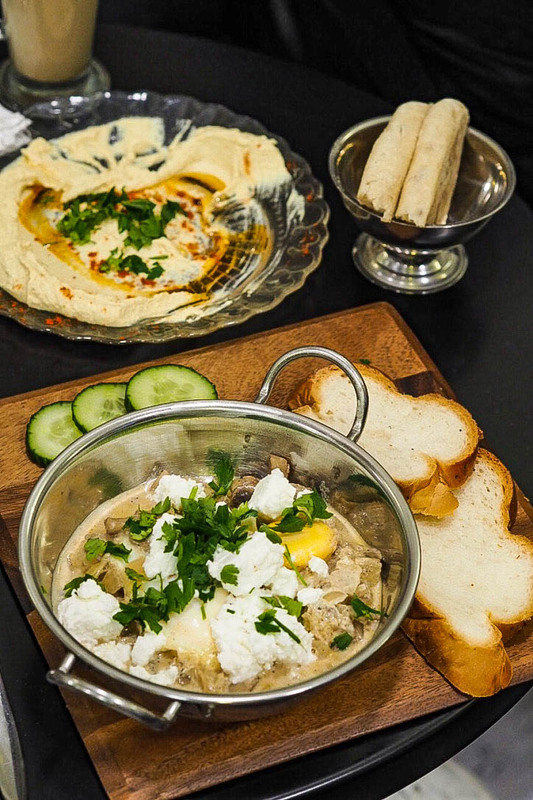 Katy had the Homeshuka, proudly stated as ‘Granny’s Recipe’, which was much more aligned with the traditional recipe but the bowl was lined with hummus first for an extra hit of tahini richness. 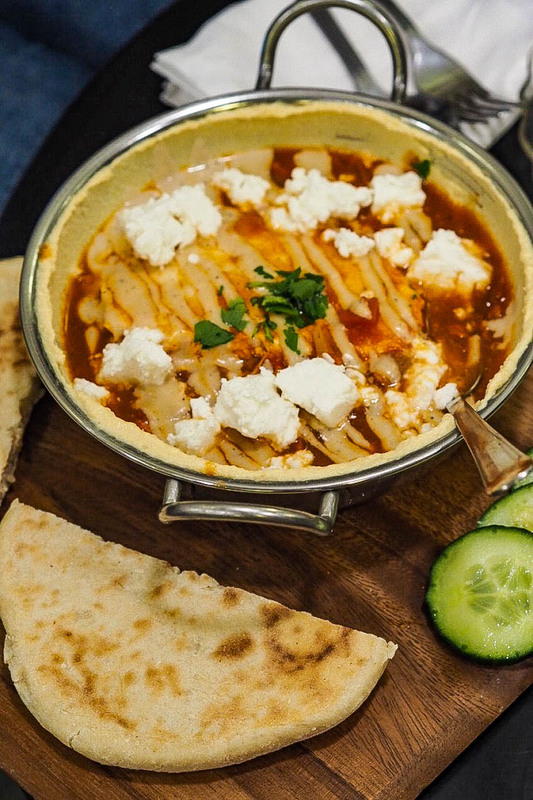 I had a spoonful and, if you’re not keen on veering too far from the norm, this is perfect as it is loyal to the tomato flavours of shakshuka. It was a genuine pleasure to find somewhere so calm and cooking genuine, homely and delicious food amongst the reheated and questionable food choices elsewhere in the market. Cafe Loren is undoubtedly a real gem. My meal at Cafe Loren was complimentary. All opinions are unbiased and my own.